Happy Day-After-Thanksgiving! Did you stuff your face appropriately yesterday? I not only stuffed my face, I worked it so that I only had to make two dishes for this year’s meal, while my awesome stepmother made the rest of the food, including dessert, which was chocolate bourbon pecan pie. I mean, I totally won Thanksgiving this year. So, while I realize that nothing that doesn’t have chocolate, bourbon, and pecans in it will sound at all appetizing at this point, I did get some requests to post the recipes for the dishes *I* made, and since they turned out pretty yummy, I am happy to do so. We’ll do the savory dish today, and the sweet one tomorrow. Clearly I need to work on my foodie photo skills. I only recently came to appreciate the delectable qualities of butternut squash, a situation that I blame on my childhood, during which I was repeatedly made to eat sliced, fried winter squash, something I did and still do detest. Bleccchhh. It wasn’t until grad school that a roommate of mine introduced me to the wonders of acorn, butternut, and spaghetti squash, and I was all, the GOURDS! They are more than just an awesome alt-country band! If using a whole squash: Cut squash in half lengthwise (use a rubber mallet – it really helps! Plus how fun is it to use a mallet in the kitchen? ), and scoop out seeds & fibers with a spoon. Brush cut sides of squash with 1 Tbsp. oil, and sprinkle cut side with salt and pepper to taste. Place squash on baking sheet, cut side down, and roast until soft, about 40 minutes. Let squash cool a bit, and scoop out flesh into a large bowl. If using pre-cut squash: Toss cubed squash with 1 Tbsp. oil, a generous pinch of salt and pepper, and pour onto baking sheet. Roast until squash is tender, approximately 25 minutes. Remove from oven and put into large bowl. While squash is roasting, quarter onion and slice into thin crescents. In a large skillet over medium-low heat, saute onions in remaining 1 Tbsp. olive oil, stirring occasionally, until soft and golden, about 20 minutes. In large bowl, mash roasted squash until of even consistency. Add whole egg, egg yolk, cream, and stir until blended. Stir in smoked Gouda, Fontina, and goat cheese (it will be nice and chunky), thyme, rosemary, and salt and pepper to taste. Spread caramelized onions evenly across the bottom of the tart or pie crust. Pour cheesy squash filling into shell, smoothing the top. Sprinkle shredded Parmesan evenly across the top. Bake tart in middle of oven until filling is set, about 40 minutes. Cool tart in pan on a rack for at least 10 minutes. Serve warm or room temperature. Now, you might say anything with that much cheese and cream in it will taste pretty amazing regardless, and of course you would be right. I mean, you could pretty much just throw all the dairy ingredients into my mouth at the same time and I’d be a happy camper. But there’s something about the smokiness of the Gouda combined with the nutty sweetness of the squash and onions and the sharp taste of the fresh herbs that is … mmmmmm. In fact, I think I might have to go heat up a leftover piece for my dinner right now. 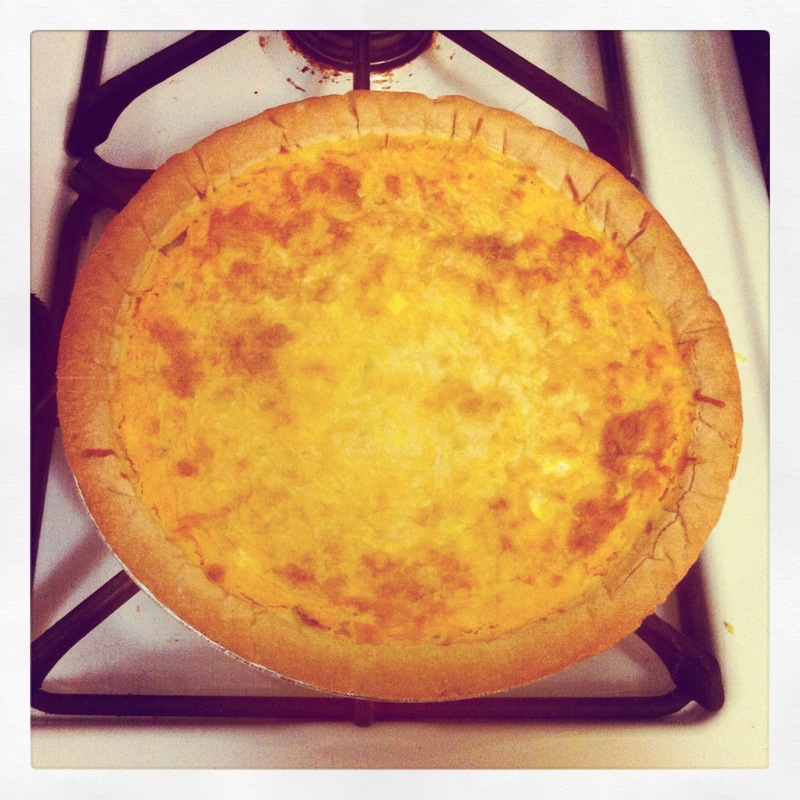 This entry was posted in Domesticity and tagged recipe blogging, savory food. Bookmark the permalink.